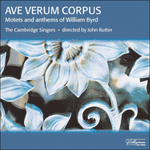 Motets of this type, where one of the voice parts (in this case the tenor) consists of a plainchant cantus firmus in slow notes, passed out of favour after the Reformation, not least because plainchant was itself jettisoned by the reformers. Byrd wrote about a dozen specimens of this essentially archaic form, mostly in his early years; Christus resurgens was published in the 1605 Gradualia, but may well have been written much earlier. If so, Byrd had good reason to remember it and want to see it in print: it has an atmosphere unlike any other of his pieces—defiant, powerful, gritty, bespeaking the struggle and victory of the Resurrection. mors illi ultra non dominabitur. Quod enim vivit, vivit Deo. Alleluia. Quare non servabant petram iustitiae? aut resurgentem adorent nobiscum dicentes Alleluia. death hath no more dominion over him. For in that he liveth, he liveth unto God. sealed with a stone lost the King. Why did they not guard the tombstone? or with us worship him risen, saying Alleluia.